Sons & Daughters In Touch- "They Were Our Fathers". therefore, I have decided to share this day with you. I Shined My Boots Today- I am on my way out for Orange County's first Iraq US Solider a Marine's funeral at the Riverside National Cemetery, Corporal Jose A Garibay, he was a 21 year old, not married, no children <whew>. I have never been to a military funeral of an ACTIVE member, much less killed in combat, other than that of my dad's which I do not remember. May 24, 1968. What an amazing day it was........It seemed like the day lasted forever, yet it went by so fast. 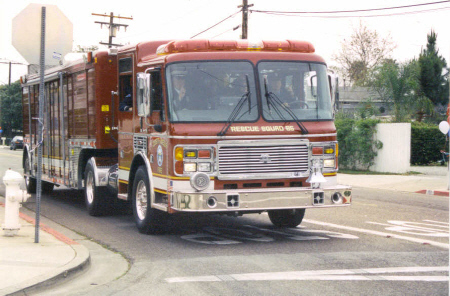 Below is a link with photos I found on-line of the funeral. I was very happy to see that Nina McCoy, Daughter of SFC John L McCoy (USA-MACV 1964) join me at the Riverside National Cemetery along with members of V V A Chapter 47- Riverside. Just before leaving for the funeral, Doc Bosma, the Veteran who was vital in connecting myself with those who knew my dad, sent me an instant message. I told him that my dad's flag had been unfolded by my stepfather and I wondered if the Honor Guard, after the funeral would fold mine. He said...they would be Honored. I had folded the flag with a friend of mine, but it just wasn't right. So I put the flag in a duffle bag and off we went. 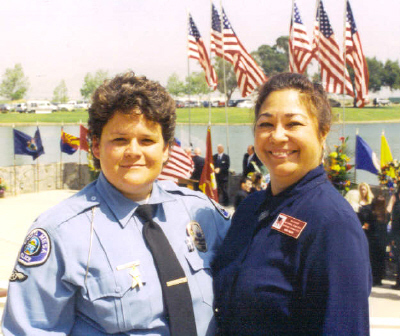 After the memorial service at the church, my work partner, Josie and I had to sneak out to assist with traffic control for the processional. It was interesting to be out there...and actually have people get mad because we had closed down the street. 99% became somber when we told them what we were doing...and then there is the 1% and I won't even go there with what I really think of them. My Sgt. told me that he was sooooo amazed to see people standing on the freeway overpasses waving American flags, saluting and with supportive signs for CPL Garibay to see. He recalled a man on a white horse, as they approached the cemetery holding and American Flag. My Sgt. 's eyes got teary-eyed as he told the story with excitement. We arrived at the Riverside National Cemetery and as I walked from our unit to the amphitheater what do I see by a FIRST CAV PATCH on an Army uniform. I walked up to the soldier briefly told him I was a FIRST CAV-KID and asked him if I could take his picture after the graveside service, he shyly agreed. When I saw him in his uniform, of course I thought..."dad is here today". This had been the first military funeral that I had attended since my dad's death and it was also a first for Nina. We sat next to each other, silent, but supportive. After the service I told Nina that they had forgotten to play TAPS...she said they had, I could not believe that I didn't hear it, I guess I had to block it out, because of course the tears do come and I was in my police uniform, you know..that "i must be strong" attitude. After the ceremony I took a pic with the 1st Cav Soldier, who then told me..."I guess you recognize this?" he pointed to the artillery insignia on his lapel...well then at that point of course he was my new best friend :) He was very young, however said he was now a veteran and had been out of the Army for about a year. Of course I asked him if he had been to Ft. Sill, Oklahoma and yes he had. 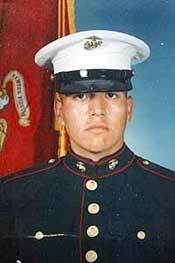 He was a childhood friend of Cpl Garibay. Nina and I then walked over to the Honor Guard which included those who did the 21-gun salute. I started to talk.....and then...THAT LUMP IN MY THROAT took over and thank God Nina was there...so she took on the Big Sister Roll....she told them who we were...and what I "needed" them to do. She wasn't even done asking them..when those with their rifles...backed away..and stood in a straight line at attention. I open the duffle bag and as I fumbled with the zipper...one of the Marines said..."I'll get that for you ma'am" and took over. They unfolded my dad's flag....which had not been unfolded for years...I could not believe how dingy it had gotten, since that day were it laid draped over my father's casket- 35 years next month. The two Marines began to fold the flag as I watched..just about 5 feet away. When they finished folding it..one Marine saluted it and then the other Marine handed it to him and saluted it and then they gave it to me. Slowly a few of the Marines came over to me...expressed their condolences and thanked me. Another 'kid' here who just returned from a funeral in Little Rock, AR for an Iraqi Freedom casualty. 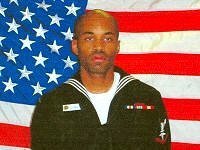 Navy Hospital Corpsman Second Class Michael Vann Johnson, Jr.. Quite an emotional day. And thank you, Jeanette for sharing. I was in the same situation with my fathers flag but would have never thought to take it with me if you had not shared that. They were very gracious to do it for me - it was so touching! And they were so young - Vietnam seemed like another world to them, I could see it in their eyes. A combination of amazement and uncertainty. Unfortunately I didn't have anyone to go with me so it took 3 tries before I could convey what I was wanting. They were very understanding. There were a lot of people there but I was disappointed that more of the community did not show up. Nothing short of standing room only would have been acceptable - but the general population doesn't all feel like we do. And I do not think the information was issued to the public as well as it should have been.....but it was a very special service. And the support and respect from the law enforcement and firefighters was VERY moving. And yes it was definitely a memorable day. 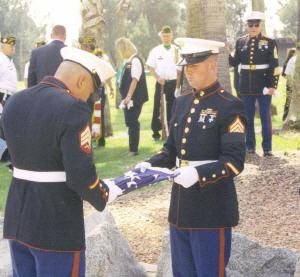 APRIL 18, 2003- I think it is so neat that you had an opportunity to go to a fallen soldier’s funeral and get your dad’s flag folded by REAL soldiers. I am so jealous. There was a funeral for a soldier about 30 minutes from me, but I was unable to attend. Plus, my mother is sort of a wacky person and she left my dad’s flag out in a box in a carport and it got wet and moldy all over. So she threw it in the washing machine and the red ran all into the white. I finally was able to secure it from her and sent it to a drycleaner who worked on it for about 2 months. They got almost all of it out, and then I added lemon juice to a few spots and left it out in the sun. It’s pretty decent now. I want to buy a special rectangular glass case, get someone to fold it into a triangle for me, and place it in the glass case with other memorabilia surrounding it. May 30, 2003- I forgot to mention one of the most important reasons I went to DC! I got my dad's flag folded [Jeanette told me to bring it] at the Marine Barracks during the Evening Parade. It feels so good to have that completed. Now I can add it to my dad's memorial in my home along with his framed name rubbing and medals. Marine Barracks Washington,DC "8th and I"